On March 9, at the initiative of the Working Women’s Commission of the Democratic Independent Workers Party (POID) of France, a rally was held before a packed auditorium in the outskirts of Paris to commemorate March 8, the international day of struggle for women’s rights. Many women from across France took the floor to testify about the consequences of the Macron-Philippe government’s policies and to share their struggles. They explained that French women are the first victims of laws that have undermined the Labour Code, in particular, considerably worsening the conditions of exploitation. It was very much an internationalist gathering, during which Hassina Sadet, representative of the Left Radical of Afghanistan (LRA), spoke about the horrific situation facing women in her country. Messages from Algeria, Pakistan, Palestine and Italy shed light on the reality of working class women’s struggles in these countries. Christel Keiser highlighted the double oppression suffered by women: “Frederick Engels, Marx’s comrade in arms, already explained in the book titled ‘The Origin of the Family,’ published in 1884, that very long ago, when men and women lived in large communities (known as primitive communism), there was a division of labor between men and women. Women, collectively, were responsible for domestic tasks. The men, collectively, were in charge of providing food. “The task,” she said, “is to put an end to all the attacks by the government, of which women are the first victims (wage inequalities, insufficient number of places in childcare centers, closure of maternity hospitals, shortage of medical gynaecologists, closure of abortion centers, undermining of reversionary pensions and bonuses for children, etc.” She went on to say she was surprised by the argument that “voting well” in the European elections on May 26 would solve all the problems. A major issue for both women and men today is the need to break with the European Union. And she concluded with a call to join the POID, a party that is situated solidly on “the field of the working class” and “that advocates the unity of women workers and workers, the unity of private and public employees, the unity of “French” workers and workers from other countries and of immigrant origin. Yesterday March 8th, the international day of struggle for women’s rights, for the third time in a fortnight, millions of Algerians took to the streets of every town and city in the country, and even of villages, to demand an end to the regime, but also to demand full and genuine equality in every field — and, in particular, the repeal of the Family Code. What exactly is the Family Code? It is a code of law that was voted in 1984 by the single-party Parliament. It strips women from every single right as citizen and imposes the status of “lifelong minor” on them … . The struggle for the repeal of the Family Code and for equal rights for women is still a relevant issue. 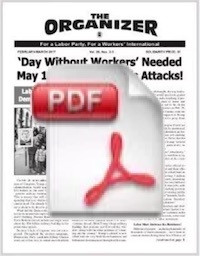 Struggles in the working class and led by working people, by the working women commission in the trade union federation on those points, are examples to be followed. The combat does not ignore the specificities of women’s particular demands. We are opening our doors wide to working women, to girls and students to tackle the existing social order, which is the root cause of inequality, “hogra”* and backward morals. Dear friends and sisters, let us go forth for democracy and socialism! “Cuts in the budgets of the welfare state, social assistance, childcare services (childcare centers, nursery schools), health (maternity hospitals, hospitals, paediatrics, care centers for the elderly), considerably increase the difficulties faced by women in reconciling family and professional life. In 2018, as many as 25,000 women were forced to resign from their jobs after the birth of their children. “It should be added that the current Salvini-Di Maio government, through a whole series of legislative measures and the blows against Law 94 on voluntary termination of pregnancy (abortion), encourages a sexist vision of society and promotes a patriarchal culture that was thought to have been definitively eradicated. 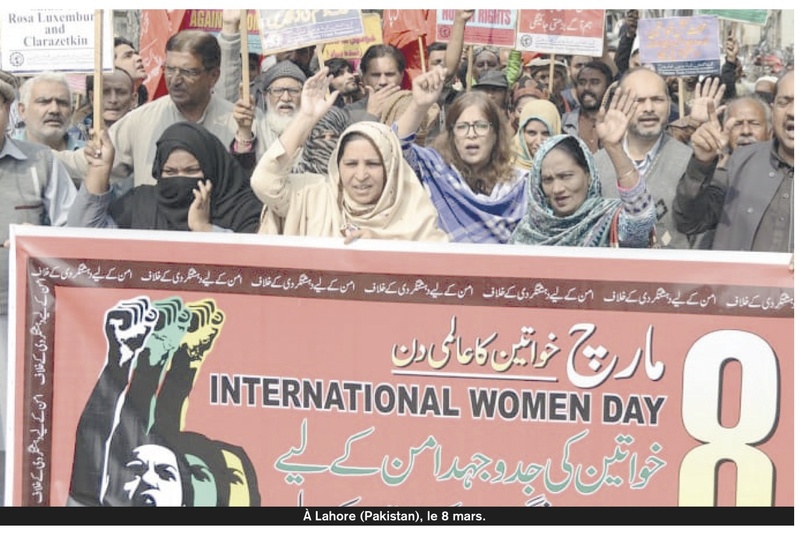 Rubina Jamil, General Secretary of the All-Pakistan Trade Union Federation (Pakistan), who demonstrated on March 8 in the streets of the industrial city of Lahore (see photo), had joined up initially with Hassina Sadet (Afghanistan) and Christel Keiser (France) to issue an International Appeal to Mobilize on March 8, 2019, in support of working women’s rights. 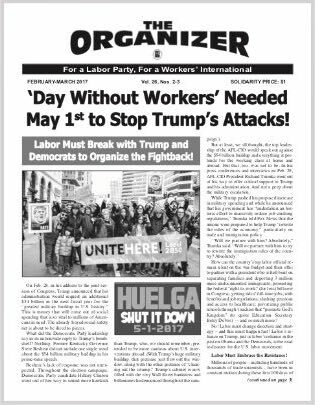 “We salute the memory of Rosa Luxemburg, who played an essential role during the First World War, by campaigning for the general strike as a rallying factor for the working class, thus paving the way for international socialist revolution … . The war led by US imperialism after September 11, 2001, resulted in the deaths of several millions of people, including women and children, in Iraq, Afghanistan — and it also hit Pakistan hard. 70,000 people, including women and girls, have been killed and others still suffer from the consequences of their injuries … . “Now women’s voices for peace must resonate louder than the trumpets of war. Women can bring peace by mobilizing on both sides of the [India-Pakistan] border, forcing war criminals to stop and talk to each other to solve problems through negotiation. It is by building friendship between peoples that we can put an end to terrorism. Women have the power to stop violence, a power greater than that of violence itself. It is time for women in India and Pakistan to exercise this power. “Valiant and fighting Palestinian women, we celebrate March 8 this year in a situation where the world in general, and the Middle East in particular, is facing a difficult situation due to the aggravation of the crimes of occupation against our people, the prolongation and extension of wars, the oppression and denial of the rights of peoples, the plundering of their wealth, the brutality of terrorism, the growth of racism and the rise of the extreme right … . “Despite everything, the women of the world, and in particular Palestinian women, in celebrating March 8, express their attachment, hope and determination to raise high the banner of the struggle against the heinous Israeli occupation, for the freedom of our people, for independence, for the right of return, to achieve justice and equality and to end all forms of discrimination, in order to consolidate peace and progress for all peoples of the world. “The Women’s Committee of our trade union federation, in celebrating March 8, would like to warmly greet all women activists all over the world, all Palestinian women, all workers, whether inside or in the diaspora, all our brave and courageous prisoners.